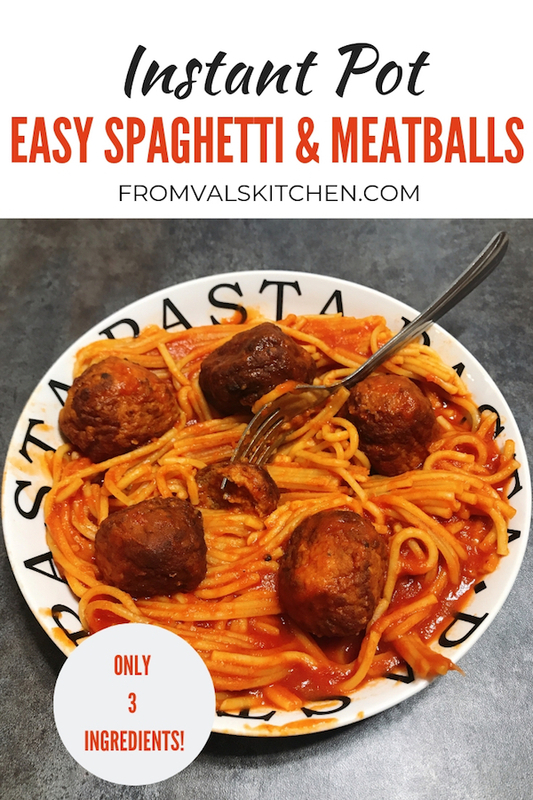 You are here: Home / My Recipes / Easy Instant Pot Spaghetti And Meatballs Recipe – Only 3 Ingredients! Easy Instant Pot Spaghetti And Meatballs is a one-pot meal that goes from counter to table in under 30 minutes and only calls for 3 ingredients. 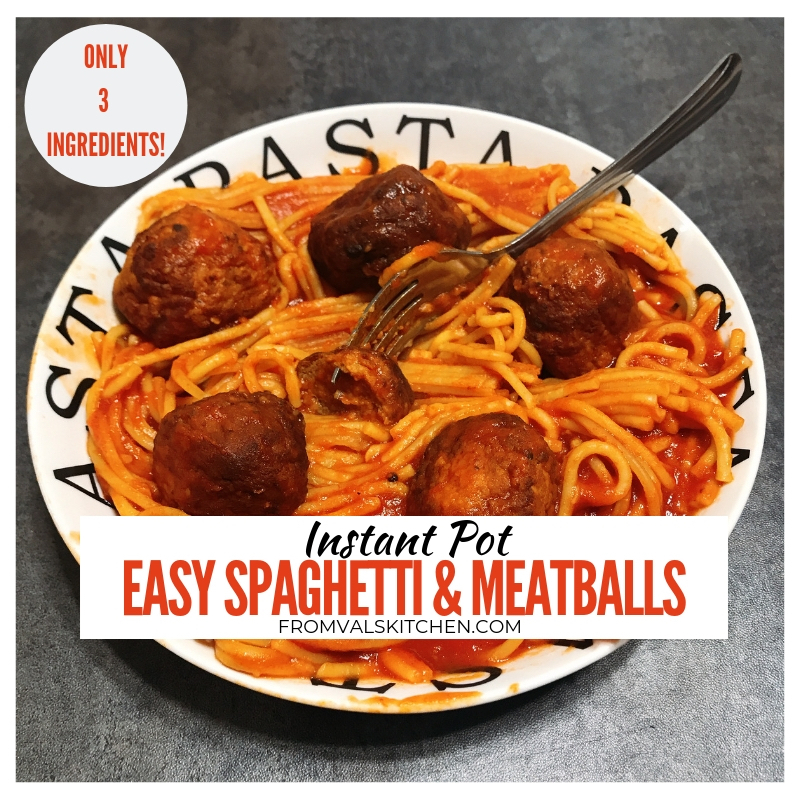 Easy Instant Pot Spaghetti And Meatballs – Only 3 Ingredients! So many people, adults and kids alike, love spaghetti and meatballs because it’s classic comfort food. While we do love to sit and enjoy a plate, some folks don’t have the time or desire to make meatballs from scratch. Frozen meatballs are your friend if you’re one of those people. Easy Instant Pot Spaghetti And Meatballs is a one-pot meal that goes from counter to table in under 30 minutes. This super simple and easy meal is perfect for those really busy nights. It also works well if you have limited kitchen access, for example if you’re in a camper or motor home, because it’s made completely in the Instant Pot and doesn’t even require a strainer to drain water. 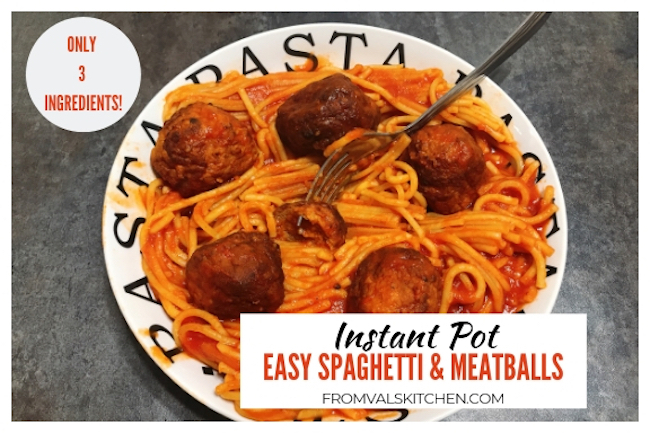 Here’s how I make Easy Instant Pot Spaghetti And Meatballs. Plug in the electric pressure cooker. Cover the bottom of the pot with a thin layer of olive oil. Place the meatballs into the pot. If you use the “dinner size” frozen meatballs you should wind up with one full layer and one or two slightly raised above the rest. Break the spaghetti in half and place into the pot. You can put it in different directions if you like. You can also leave it all in one direction, but be aware some of the noodles may be prone to sticking together a little bit if you go this route. Pour the two cans of tomato sauce into the pot. Fill one of the empty tomato sauce cans with water and pour that water into the pot. Be sure that all of the pasta is covered. Place the lid onto the pressure cooker and close to seal. Use the spaghetti server to give a quick stir. It may look like you have a lot of sauce but once you stir it won’t. Serve immediately with salt, pepper and grated cheese if desired. If you’re looking for other dishes to make in an instant Pot electric pressure cooker be sure to check out my pressure cooker recipes! This is the most popular category on my site and it contains lots of one-pot recipes that can be made in an Instant Pot or other electric pressure cooker! Easy Instant Pot Spaghetti And Meatballs Recipe - Only 3 Ingredients! Plug in the electric pressure cooker. Cover the bottom of the pot with a thin layer of olive oil. Place the meatballs into the pot. If you use the "dinner size" frozen meatballs you should wind up with one full layer and one or two slightly raised above the rest. Break the spaghetti in half and place into the pot. You can put it in different directions if you like. You can also leave it all in one direction, but be aware some of the noodles may be prone to sticking together a little bit if you go this route. Pour the two cans of tomato sauce into the pot. Fill one of the empty tomato sauce cans with water and pour that water into the pot. Be sure that all of the pasta is covered. Place the lid onto the pressure cooker and close to seal. 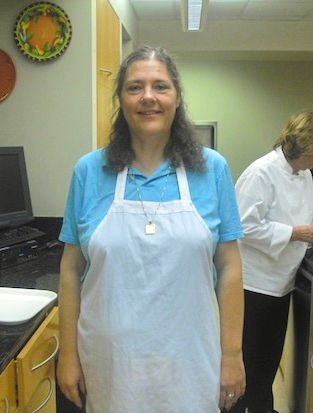 Set the pressure cooker to cook for 8 minutes on manual high pressure. Once the cooking time has ended do a quick pressure release. Serve immediately with salt, pepper and grated cheese if desired. Enjoy! Mark this quick and easy.